Home » Programs » Milwaukee Green STEM » Get Involved! Milwaukee Green STEM builds a coalition of environmental organizations in the Milwaukee metro area constructing capacity for environmental education in an urban area. 27 organizations have been involved with Milwaukee Green STEM through trainings, events, or as close partners. Milwaukee Green STEM impacts students, educators and organizations; aiming to transform potential by sharing resources and knowledge. This page contains information for how educators and learners can get involved. Milwaukee Green STEM shares DOTS with school partners by training educators. DOTS Training events cover pedagogy for student-driven inquiry and technology integration for STEM curriculum in an outdoor field setting. Educators have described these trainings as “exactly what professional development should look like.” If your organization is interested in hosting a DOTS Training, follow this link to the DOTS Lending Interest Form and indicate that you have not received a DOTS Training. You will then be able to request a training; an Upham Woods staff member will be in contact with you with further scheduling details. For more information on our trainings, please visit the DOTS Training and Lending page. Teachers also have the opportunity to have research naturalist come out to the classrooms to lead field exploration sessions, scientific method sessions or help students refine ongoing inquiry projects in sessions called Research Accelerators. Please see our Recent and Upcoming Events page for when the next Research Accelerator sessions will be. 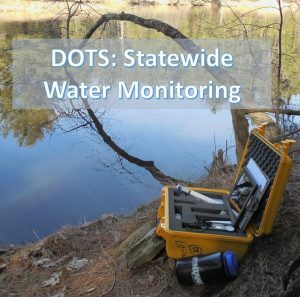 Have you used the DOTS water Quality Kits? Do you have data you would like to share with other DOTS users? Participants in Milwaukee Green STEM can upload their data to the EPA Water Monitoring web page which organizes the data in a visually digestible format through graphs, maps, and tables. Learners manipulate data by variable or into specific date ranges or locations to satisfy their curiosity. Visit the EPA Water Monitoring web page to upload your data and find out more information. Another page where you can access student data is the Digging Deeper with Data web page. This page also host student collected data from some school within the Milwaukee area. Are you interested in showcasing a project at community science fair? Science Strikes Back is a Milwaukee based community science fair that encourages community members of ALL ages to critically analyze environmental issues and solve problems in their communities. To learn more about how to get involved, visit the Science Strikes Back website. Want to see what other learners are up to? Check out some of their scientific stories!